Ian Jensen, two-term president of the Northern Calif., IPSSA Delta chapter, shares with Service Industry News what his members have done to become a special group and one of the most successful chapters today. What sets IPSSA Delta apart from other regions is the deep sense of brotherhood and solidarity amongst its members. With relationships that go back decades, they are much more than colleagues, and a typical regional meeting is an opportunity to spend some time with friends. Ian Jensen, president of the IPSSA Delta Region, takes great pride in building up the membership and participation of his chapter. An IPSSA member for 20 years, Jensen has served as both president and vice president for his region twice. His chapter is one of the largest in California. Starting with just a few people, Jensen has been a part of building the membership to 40. Jensen is the leader of an active chapter, with excellent attendance at all of their meetings. “You have to make it fun to attend,” Jensen said, noting that his meetings regularly give out prizes, hold raffles and have nice dinners. Chapter supporters, encompassing a broad group of pool and spa industry manufacturers, use the meetings to explain the ins and outs of new pool products and chemicals. Jensen cares very much that all of his members have access to the latest information available in the industry. One such way he has facilitated this is to fund all members and their subscriptions to this publication. Chapter supporters have noticed this dedication to embracing new techniques and technology as well as the large member attendance and participation and that makes it worth their while. “I’m always hearing, 'wow, you have a really great chapter,' ” Jensen said. Jensen’s chapter has a lot of support. “Our chapter supporters are phenomenal, and very generous,” Jensen said. Rick Plath, who has four times served as president for this region, gives a lot of credit to the chapter supporters as well, acknowledging that to succeed in this business, you need a lot of good contacts, as well as good classes. He believes this is one of the reasons for the good turnout at the meetings. 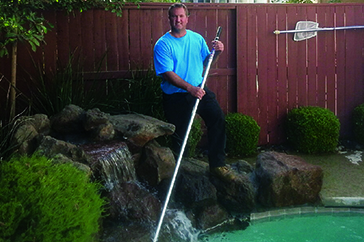 The Delta members enjoy many IPSSA benefits, such as scholarship programs and great insurance offering liability against damage to pools and spas while also protecting against personal injuries. Jensen really enjoys the service that he performs as an IPSSA president, but he also recognizes that it’s a lot of work. There’s a lot that goes on behind the scene, in trying plan meetings, build up membership, as well as organizing fundraisers and donations. What he enjoys most about his ser- vice is interacting with other members, believing that s it’s important to relay corporate information. “It makes me feel good to tell members how insurance affects us, and how it works for us,” he said. Jensen’s chapter is also generous, donating to all sorts of causes. Their philanthropy extends to widows of past members, helping prior members in times of need, scholarship programs, as well as contributing to local police programs. They also have an annual Christmas party.